I saw this idea for a Coconut Bread Pudding that was made with Brioche and it sounded really yummy. 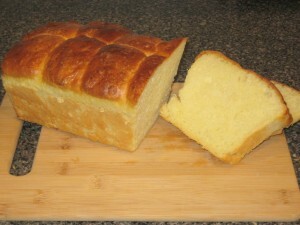 In order to make it I had to make a Brioche recipe so I opened my trusty Williams Sonoma cookbook. This dough was a huge sticky mess to work with and I stopped adding flour after an additional cup more than the recipe called for because I was worried I’d dry out my recipe and alter it too much. When I scraped it into the buttered bowl to raise it was more like a thick batter than a smooth bread dough. I refrigerated it overnight and buttered my hands well to make semi-ball shapes for baking. It came out great. It was a smooth, light bread with just the right amount of egg and butter flavor. I did eight buns for burgers and one loaf of bread. We used a couple of the buns for Salmon Burgers and froze the rest. It was a great combination. Unfortunately I didn’t count on eating the whole loaf for my breakfast toast before I could make the Coconut Bread Pudding. I’ll have to do it again.